"Snowman is back with a jolly red scarf and a nose made out of The Carrot bubble bar from last Easter. Scented with the same vanilla fragrance as our Butterball bath bomb, he also contains cocoa butter which creates a moisturising, creamy soft bath that is great for nourishing and protecting your skin." This bath bomb came in the Christmas Friends gift set that I received for Christmas and I was so excited as soon as I saw it because I'd heard it was extremely moisturising and had been lusting over it for a while. I love the design of the Snowman as it's super cute but really put me in the mood for Winter and building a snowman. Although it doesn't do anything too crazy or exciting to your bath when you drop it in, I think this means it would make a great present for someone younger or who hasn't tried too many bath bombs and wants a 'safe' option to start with. The Snowman turned my bath a pretty pale reddish-pink, which wasn't too spectacular but pretty nonetheless. I suffer from dry and sensitive skin which has been worse than normal recently due to the cold weather so I was hoping this would do wonders. I wasn't disappointed, as soon as I got in the bath I noticed the cocoa butter had been dispersed throughout the water and promptly hugged my skin, making it feel extra soft. I sometimes find that some of the more moisturising bath bombs will leave my skin and bath oily afterwards but this one sunk in easily and left my skin feeling smooth instead of greasy after I'd patted myself down with a towel. 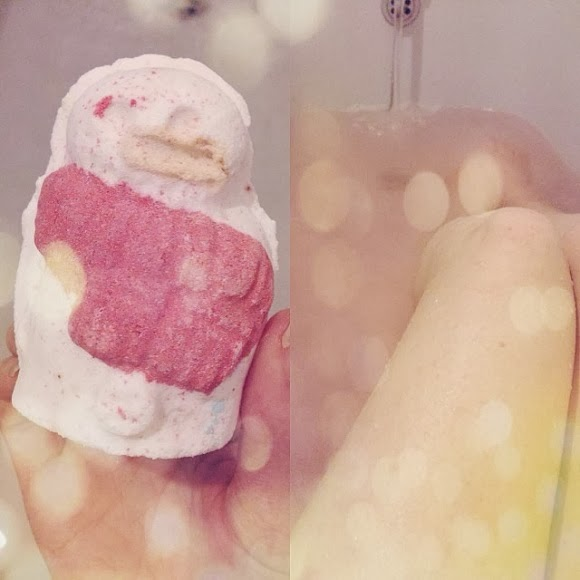 Overall I did enjoy this bath bomb, more for how it left my skin feeling than how it reacted in the bath, but I'm not sure whether I'd go out and purposely repurchase it next Christmas as I'd prefer to have one that puts on a more exciting 'show' when dropped in the bath.